My mother in law makes really good pot roast but I always love the vegetables in pot roast dishes the most. When I was packing up food last night I wasn’t sure how I’d turn this into a nice looking bento since pot roast generally doesn’t look very attractive. So to help offset the doodoo like characteristics of the meat and potatoes, I decided to make the majority of this bento focus on the salad instead. Lettuce and tomato always look really nice in a box (in my opinion anyway) and so I took a large portion of salad to go with a tiny portion of food. I figured this is healthier for me anyway. I packed some Catalina dressing in the little lion container for the salad. 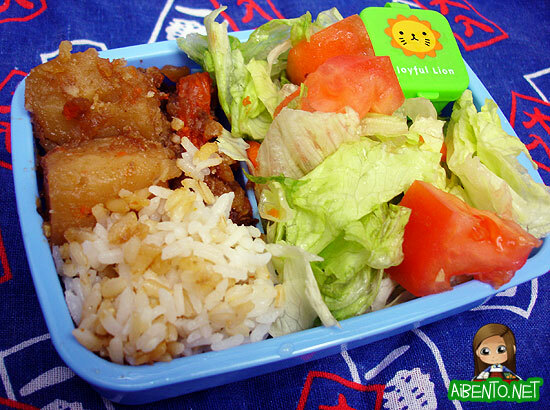 Not my best bento, but it looks yummy to me! This is packed in my Doraemon box, which is a wonderful size!! On the side I have some blackberries we bought at Costco last night. I don’t know how everyone else is doing but I am slacking so badly on Christmas shopping. I’ve bought the exact same DVD set for both my parents and presents for Mr. Pikko, my mainland niece and nephew, but that’s about it. I still have to shop for my brother, in-laws, niece and nephew, sitter, sitter kids, MY OWN KIDS, and my grandma. D: It’s December 11, this is not going to end well!! Normally I’m so good about shopping in November, but my head has been scattered with too many things lately.